When James Adams walked into Waffle House in 2009 and requested a job application, the manager asked if he'd been sacked because of the meltdown. "Yeah," Adams said. "Firms like mine caused it." The manager gave him a sympathetic look. She said he could start Monday as long as he had a pair of black pants and vowed not to steal anything. He took the job. Adams went from pulling in six figures a year as a hedge fund vice president to serving bacon and grits for $2.13 an hour (plus tips). The job came with a side of "humble pie," especially when he was put on the graveyard shift with mostly ex-cons as coworkers. His wife thought he was nuts. But he felt he needed to do "deep soul searching." "I'm willing to admit I played a role in the most horrific financial drama in the last 70 years," says Adams. 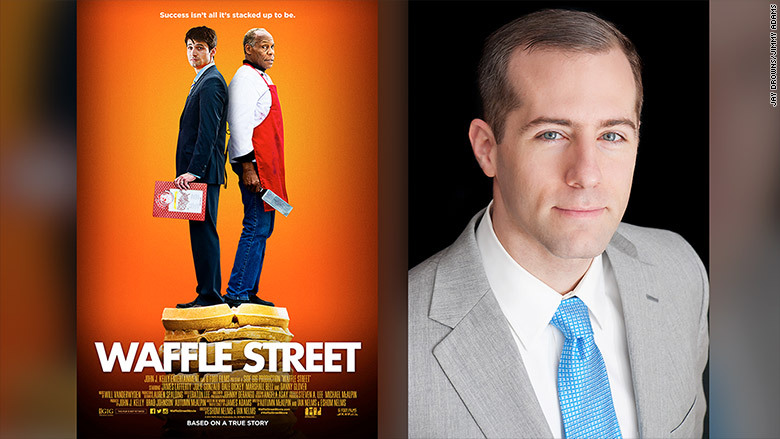 James Lafferty stars in the movie 'Waffle Street,' a real-life story of a Wall Street hedge fund guy who loses his job and ends up working at Waffle House. On his first day, he couldn't even find the cheese in the Waffle House refrigerator. Head cook Edward wasn't amused and wanted him gone. A few days later, Edward walked Adams over to a dirty table. He pointed to a yucky spot and asked Adams to wipe it off. "If you can clean off this spot, you'll be of more value in this job than you were in your last one," Edward said. Adams had to prove himself, one table wipe at a time. In his six months waiting tables in Durham, N.C., he and Edward eventually became friends. Other co-workers also came around. A fellow waiter jumped in front of a drunk customer who was about to hurl her grits at Adams. The waiter, who had been in jail twice, gave Adams tips on how to keep customers from getting to you. "I learned a lot from people that weren't bad guys. They had just done dumb things when they were young," Adams told CNNMoney. His coworkers had gone to jail for their mistakes, often involving drugs and he felt like many of them rarely got a second chance. Meanwhile, Adams -- and pretty much everyone from the Wall Street crowd -- got another chance. Adams worked for a firm that traded bonds -- including the toxic stuff. It had over $30 billion in assets before the crisis. His job title was "product manager." That means he hustled clients to invest their money with the firm and then nurtured the relationship. For much of 2007 and 2008, he spent his days telling investors that everything was just fine. In reality, they were invested in junk. The pink slip for Adams arrived in 2009, the year when U.S. unemployment skyrocketed to 10% -- one in 10 people were out of work. He applied everywhere and was even rejected from McDonald's. CNN wants to hear from you: Are YOU worried about your job? 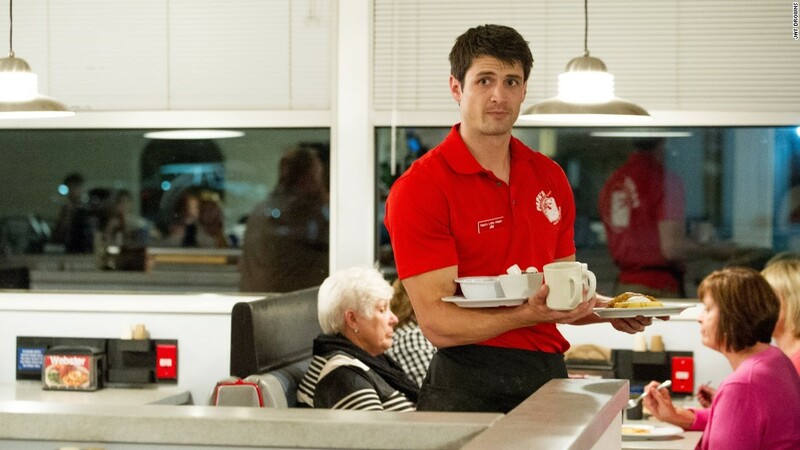 'Waffle Street' is now a film starring James Lafferty and Danny Glover. James Adams is pictured at right. That's how Adams, with a college degree from Wake Forest University and an MBA, ended up at Waffle House, one of America's employers of last resort. It's one of the few places that hire people who come out of jail. Adams chronicled his shocking tale of going from Wall Street to "Waffle Street" in a book with the tagline "The confession and rehabilitation of a financier." His life story was made into a film starring James Lafferty from "One Tree Hill" as "Jimmy Adams" and Danny Glover as the cook. It's now available on Amazon, iTunes, Hulu and other sites and has a 7.3 (out of 10) rating on imdb.com. He says the backlash against Wall Street --in the Occupy Wall Street movement, the Tea Party and now the 2016 election -- is "justifiable"
"We were living pretty high off the hog," he admits. But a lot has changed after the 2008 crisis, he says. The party is definitely over, even at the big banks. Today Adams' life is a lot tamer than his hedge fund or Waffle House days. He works at a financial trust company, where he helps people save and invest for retirement. "A bit" over 35, Adams now gives financial tips to his former Waffle House colleagues. "Here is at least one person who is fessing up," Adams says of his decision to share his story. He wishes more Wall Street types had joined him.